Beatles complete catalogue of studio albums, box set and singles are now available at iTunes. (CNN) -- It's been a long and winding road, this relationship between Apple and the Beatles. But Tuesday, at long last, the Fab Four made it to iTunes. "We're really excited to bring the Beatles' music to iTunes," Beatle Paul McCartney said in an Apple news release. "It's fantastic to see the songs we originally released on vinyl receive as much love in the digital world as they did the first time around." 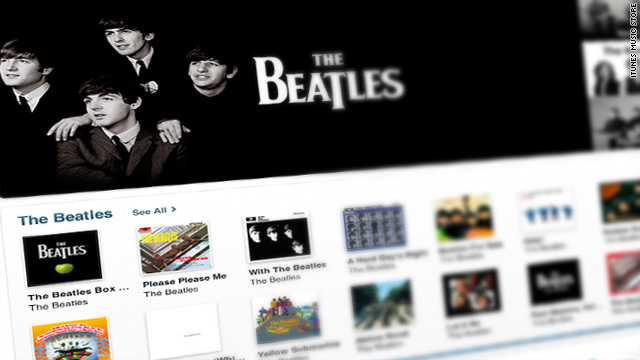 The iTunes store's main page featured a host of Beatles albums for sale, beneath an early photo of the group that started in the tiny Cavern Club in Liverpool and would go on to revolutionize rock 'n' roll. The update came in advance of what Apple had promised would be a 10 a.m. ET announcement that would make Tuesday "A day to remember." Starting Tuesday, iTunes users can buy the Beatles 13 remastered studio albums from the Apple store. Also available are the two-volume "Past Masters" compilation and the group's "Red" and "Blue" collections. Fans can also purchase individual songs and a digital box set featuring live concert film -- an iTunes exclusive, according to the release. The Beatles had famously been the most high-profile hold-out to making their music available via digital download. Things you didn't know about the Beatles. The surviving band members and the estates of the others had been reluctant to sign up, saying that the quality of digital music isn't good enough to do their catalogue justice. That being the case, the past few years had seen rumor after rumor that the Beatles were finally going to arrive on iTunes. "I am particularly glad to no longer be asked when the Beatles are coming to iTunes," said Beatle Ringo Starr. "At last, if you want it -- you can get it now -- The Beatles from Liverpool to now! Peace and Love, Ringo." John Lennon's widow, Yoko Ono, who had been vocal in her opposition to digital music's quality, said it's an appropriate time for the major music announcement. "In the joyful spirit of 'Give Peace A Chance,' I think it is so appropriate that we are doing this on John's 70th birthday year," she said in the statement. Single albums are available for purchase and download for $12.99 each, double albums for $19.99 each, and individual songs for $1.29 each. Tension between the Cupertino, California, computing giant and the Beatles dates back to the 1970s, when the Beatles claimed that the company's name infringed on their trademark for their label, Apple Records. The first agreement between the two was struck in 1981. But as Apple Computers became Apple Inc. and continued to rise in prominence, legal disputes flared up again and again. In 2006, a British judge ruled in favor of the computer company, although a final trademark dispute wasn't settled until 2007. Apple CEO Steve Jobs made no bones about being a Beatles fan throughout, but he claimed the name of his company had nothing to do with the label (a spokesman once said Apple merely wanted to be ahead of Atari in the phone book). "We love the Beatles and are honored and thrilled to welcome them to iTunes," Jobs said Tuesday. "Thanks to the Beatles and EMI, we are now realizing a dream we've had since we launched iTunes ten years ago." While the Beatles have certainly been the most prominent iTunes holdout, they aren't the last. Most famously AC/DC, the iconic Australian hard rockers, have refused to sign up, saying they have no interest in selling individual songs in place of full albums. Kid Rock and Bob Seger also are holdouts.